Rio Grande City, one of the oldest settlements in South Texas, is a unique community of nearly 14,000 residents located in the extreme south-central portion of Starr County. It serves as the seat of government for the county as well as an international port of entry, linking with Camargo, Tamaulipas, via the Rio Grande City-Camargo International Bridge. This connection provides residents and visitors easy access to the shopping, dining and entertainment of Mexico. In town, Rio Grande City, a Texas Main Street City, offers its own collection of shops and restaurants, and is committed to the preservation of its rich historical architecture. The city is part of the Los Caminos del Rio or “roads of the river” heritage corridor. Its downtown houses various notable landmarks, including the La Borde House, a two-story brick hotel built between 1877 and 1898. The hotel was saved from its dilapidated state in 1978, when San Antonio businessman Larry Sheerin purchased the structure. Today, after much restoration work, the La Borde House is open as a full-service, luxury hotel. Fort Ringgold (formerly Camp Ringgold) sits on the eastern edge of Rio Grande City and was in operation from the mid-1800s until its deactivation in 1944. In addition to the main fort, the complex houses the historic Robert E. Lee House, circa 1856. 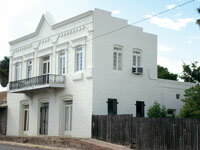 Fort Ringgold was designated a Texas Historic Landmark by the Texas Historical Commission in 1965 and is now owned by the Rio Grande City Consolidated Independent School District. Additional historic sites in town include the Mifflin Kenedy Warehouse (1854), the Arcadio F. Salinas House (1800), the First United Methodist Church (1888), the Headly-Edgerton Building (1894), the Silverio De La Pena Building (1886) and the Grotto of Lourdes (1928)—a replica of the Grotto of Lourdes in France. 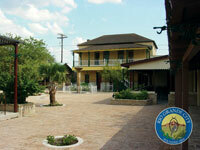 Come and explore the historical charm of this South Texas community. For more information, visit www.cityofrgc.com.